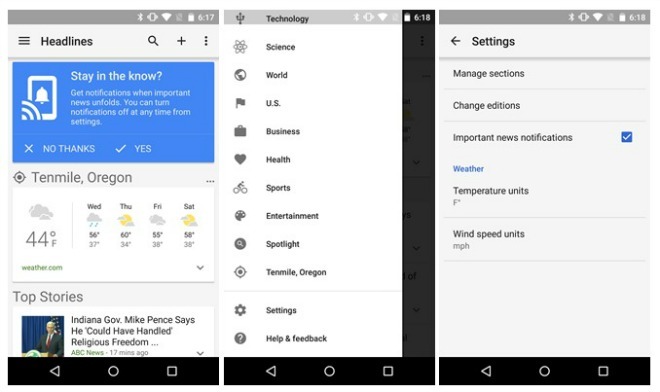 Today Google has launched the latest update to the oft-forgotten News & Weather app for Android. This started life as little more than a widget built into Android, but then got released in the Play Store last year. Since that point, it’s received quite a few big updates, this latest one probably among the biggest yet. This app is slowly but surely growing up into an interesting source for news, though Google has another app for that purpose – Play Newsstand. Anyway, News & Weather 2.3 is now rolling out, and you should get the update within a few days (if you want to skip the queue, head to the Source link for a direct download). It brings with it support for breaking news notifications. In fact, the first time you open the app after the update you should see a big blue card telling you about this feature and asking if you want it enabled (see the leftmost screenshot in the image above). Next up, the app received a proper Settings menu, because believe it or not it didn’t have one of those before. Various settings used to be scattered across the interface, but now you get a single unified place for all that stuff. You can acess this menu by sliding the drawer open and scrolling to the bottom. Finally, “Suggested for you” recommendations is a new category in News & Weather. As the name implies, in it you can find personalized content tailored to you. The recommendations look like they’re based on your search history, but could also rely on reading habits and Google Now data. Under each recommended story you get a question about whether you’re really interested in that topic, and how you answer should be used to further improve this service. A “Manage interests” section lets you reset your preferences at any time.